The contribution of the artists in the neighborhood of Jackson Heights aims to counterbalance the gentrification process. Experiential Critique on Hyperconsumerism as an art project does not an attempt to moralize, but to create a space for reflection and thoughtful, collective, collaborative creative construction of popular knowledge. We approach art from a Freirean pedagogy in which the making is closely linked to the know how. Recognizing and collecting the existing popular knowledge in our community is part of our strategy. Barco de Papel’s Art Program commissioned this art work to two artists, Joyce Sanchez and Maria Gil. During the summer, Barco de Papel received second hand clothing during the summer which was given to the artists to create an installation and textile sculptures. Clothing is as our second skin. The usage, forms and concepts around fashion change according to practical issues, to environmental needs, matters of taste, technological development, and all the various cultural, religious, symbolic and social values that surround us. Most of the collected clothes are very popular brands, such as GAP, American Eagle, Old Navy or H & M, brands overvalued in underdeveloped countries, and in developed countries they are popular and mainstream. These clothes have now been rejected for various reasons; they might recall specific moments of their former owners lives, stages of joy, sadness, dreams, but we as artists are reconsidering their meaning through their modification and transforming them in pieces of art. The Barco de Papel’s Visual Art Program offered a textile workshop on Sunday, October 16, 2016 directed by the artist Joyce Sanchez. 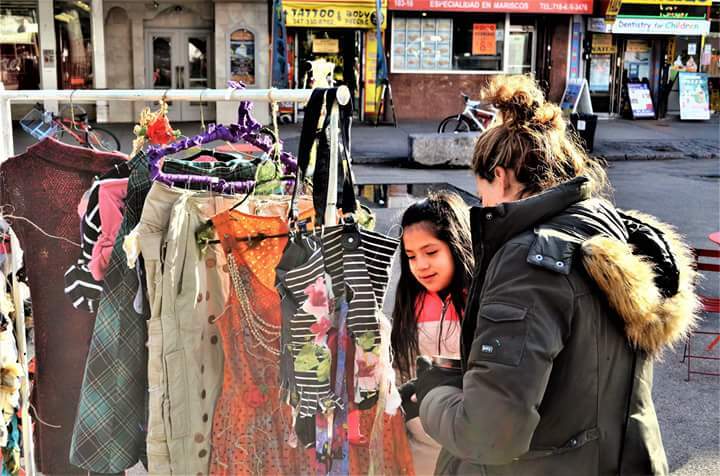 Neighbors and children with their parents enjoyed an afternoon where DIY art merged reflexively and to stimulate sensibilities in our community as consumers. Different pieces were intervened and will be exhibited in an outdoor installation for the whole community on Sunday October 23, 2016 from 12-5 pm at the Frank D. O’Connor Playground located at 78th Street and Broadway Avenue in Elmhurst. The materials used for this workshop were donated clothes, silicone, rubber, paints, fabrics, yarn, necklaces, buttons, among others. We thank volunteers and Janex Txeis for the photography. Public Art Experiential Critique on Hyperconsumerism. 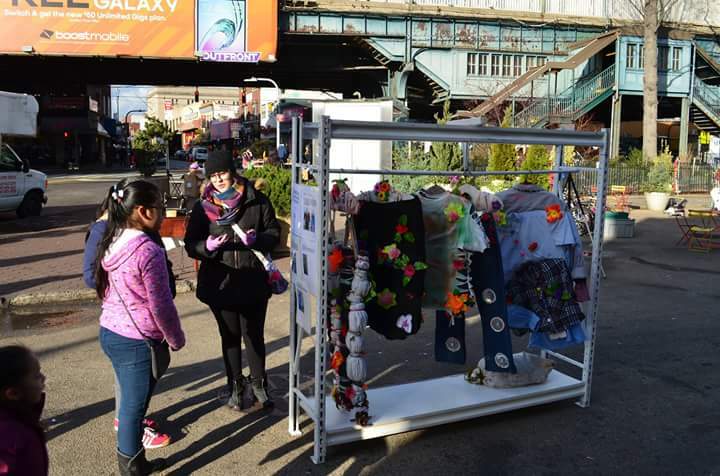 Action Art Experiential Critique on Hyperconsumerism at Corona Plaza -Friday, 30th. SITE, DATE AND SCHEDULE: Textile sculptures will be exhibited on Friday 30th from 1pm to 5pm. hyperconsumerism and the belief that having more gives us happiness. For this, we have created a space in which passers-by can interact and be part of the visual narratives implicated in the different textile pieces made by artists Joyce Sanchez and Maria Gil. Both artists were challenged to go beyond the functionality of each of the pieces of clothing they were given and dedicated months to turn them into works of art by giving them a new meaning. The technique they use is mostly bricolage. Cultural identity through everyday objects. The phenomena of visual culture today not only occur in museums, galleries and exhibitions. Many cultures and urban sub-cultures have developed the same principle of “intervention” or “modification” of objects, clothes, tattoos, cars, etc., to aesthetically identify and demonstrate their vision of the world through signs and colors. Urban street art has transformed metropolises around the world with the creative use of the permanent living spheres of our communities. Centro Cultural Barco de Papel has proposed a visual and learning artistic experience using commonly used objects, such as: doors, windows, chairs, tables, amongst others. These will be modified creatively by guest artists and the general public, thus creating “unique and unrepeatable” works without changing its original function, providing them with new, unique and creative sensibilities in the present. These commonly used objects allow for our participants to appreciate a beautiful item, as an alternative to entering a store and buying said item. Most people underestimate their creative abilities. Looking at items in your home, such as a cupboard, a shelf or a chair, would you dare to put your signature on it? When a person exerts action, one feels ownership over the object for you have expressed your taste through choice of color, design, texture. The kitchen is that warm part of the home where families once met. There, in the heat of the fire, while eating, doing the chores, mending clothes or drinking coffee while they were intertwined stories that have gradually been forming part of our culture. It would not be exaggerated to say that many of our traditions were passed down from generation to generation around the home fire. We want to recover for our workshop “Random Kitchen”, this symbolic place of the house, programming five totally free workshops that will take place in different houses in our community. From Saturday, February 28 to Sunday, March 5, where people from different professions will take part in recycled clothing in a totally home environment. In these workshops we take into account the richness and cultural variety that exists in our community. We learn from all cultures, while having fun recycling clothes and intervening in a creative way achieving a unique piece of originality in each workshop. This workshop is organized by the Visual Arts Program of the Barco de Papel Cultural Center in collaboration with the community organization Voces Latinas and artists residing in the city of New York.